Calling all Starbucks lovers!!! Starting today, November 10th through November 14th, Get Buy 1 Get 1 FREE Holiday Beverages between 2pm and 5pm every day! These include hot, iced OR blended drinks. 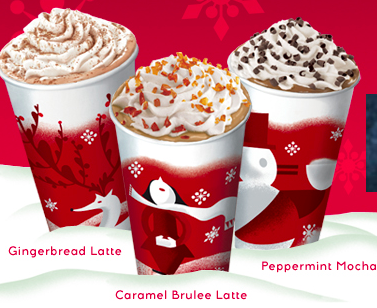 The holiday beverages are: Chestnut Praline Latte, Peppermint Mocha, Skinny Peppermint Mocha, Caramel Brûlée Latte, Gingerbread Latte, Eggnog Latte, Teavana Joy Brewed Tea, Spiced Sweet Cream Narino 70 Cold Brew. YUM!